The Australian government is poised to lose its one-seat majority in parliament with almost half the votes counted in a crucial by-election late on Saturday, threatening the ability of the centre-right coalition to govern. 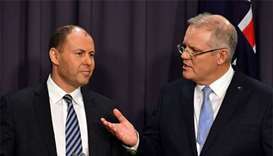 The Fairfax-Ipsos poll published on Monday showed Scott Morrison well ahead of his centre-left Labor opponent Bill Shorten as preferred prime minister. 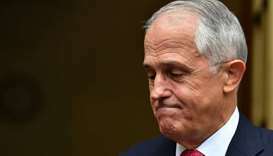 The Liberal Party fractured in August when a backbench revolt forced then prime minister Malcolm Turnbull from office. 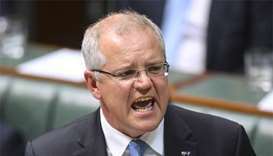 Scott Morrison was sworn in as the country's 30th leader late on Friday after a bitter Liberal Party revolt against moderate Malcolm Turnbull. 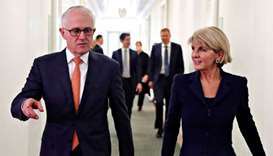 Julie Bishop announced she would move to the backbench and had not yet decided whether to contest the next election, which is due by May 2019. 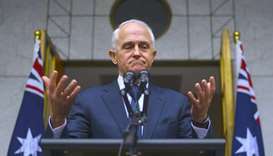 Australian Prime Minister Malcolm Turnbull stubbornly clung to power on Thursday as senior ministers deserted him, saying he would hold a second leadership vote on Friday only if he received a letter signed by the majority of the ruling party. 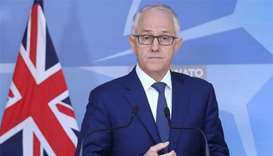 Australian Prime Minister Malcolm Turnbull survived a leadership challenge by Home Affairs Minister Peter Dutton on Tuesday, government officials said, but the narrow margin of his win did little to dampen speculation about his future. The bill had been stalled in the finely balanced parliament before Pauline Hanson, leader of the nationalist One Nation party, broke the impasse. 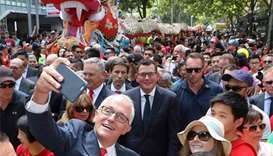 The latest Newspoll, published by The Australian newspaper on Monday, gave Turnbull a 40% approval rating. 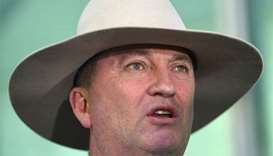 Barnaby Joyce leads the rural-based National Party, the junior partner in the centre-right government led by Malcolm Turnbull's Liberal Party, a political alliance that has existed since 1923. Malcolm Turnbull, whose coalition holds a razor-thin majority of just one seat, said on Thursday that Barnaby Joyce had shown a "shocking error of judgment" for conducting an affair.